This event is an audio visual discourse around the endless regeneration of the hems in District 4. 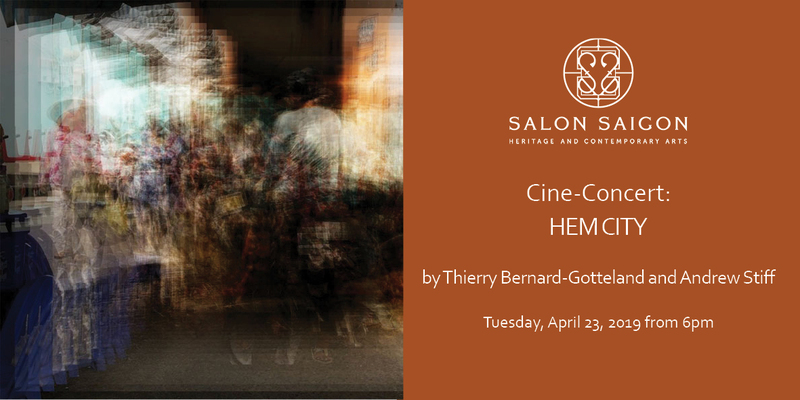 Using audio by Thierry Bernard Gotteland and Visuals by Andrew Stiff, this event uses the loop as a means of expressing change and regeneration as a cyclical event in the hems. Both artists are lecturers of experimental design at RMIT Vietnam and researchers in the hems research project, conducted with the University. Andrew Stiff is a Lecturer at RMIT University Viet Nam, teaching in design. He specialises in experimental design and moving image. He studied painting at Chelsea School of Art [now part of the University of the Arts London], and ‘Information Systems and technology’ for his masters degree at University of Liverpool. After working with the experimental digital design collective D-Fuse, he started his academic career running a masters degree in Digital Art, at Camberwell college of Arts, University of the Arts London. He is currently undertaking a practice based PhD at RMIT University, in the School of Graduate Research: Architecture and Design. The research is titled: ‘Intimate Spaces: An archive of creative observation’. Andrew Stiff’s design practice investigates the process of collecting, archiving and (re) producing physical and ephemeral data from the urban realm. Using and exploring the possibilities of digital tools, his practice employs moving image media, in experimental forms. His work has been shown internationally from the US, Hong Kong, Japan and in South East Asia, as well as a number of venues in Europe. Thierry Bernard-Gotteland is a Lecturer at RMIT University Viet Nam, teaching in design. He specializes in experimental design and audio production. He studied at the Superior Art School of Grenoble in France and went up to Le Fresnoy, French National Studio of Contemporary Arts enrolled in a post-graduate residency program conducted by acclaimed artists like Gary Hill, Atau Tanaka & Antoni Muntadas. Working with RMIT University Vietnam for the past 10 years, he is currently developing his artistic research through an offshore practice-based PhD with RMIT Melbourne where he is actually investigating through the lens of context/content about audio driven experience in installation and performance art. Thierry is also working with Galerie Quynh since 2011 with his first solo show entitled: A Physical Obedience of a Certain Geometry, Nihil Sublime.